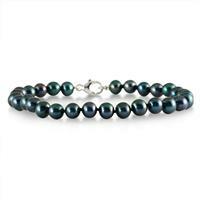 A 3 Day TGIF deal on an all natural freshwater pearl bracelet with a .925 sterling silver clasp for a deal price of just $19 shipped. Quality double knotted pearl strand with excellent quality black pearls at an unbeatable TGIF deal price. Deal available thru Sunday only!